Singapore, a cultural melting pot and one of my favorite food capitals with its hodge podge of Chinese, Singaporean, Malay, Indian, Korean, Peranankan, and Thai cuisines. It is Asia’s dericiousness all bundled up in one, hot and humid culinary mecca. 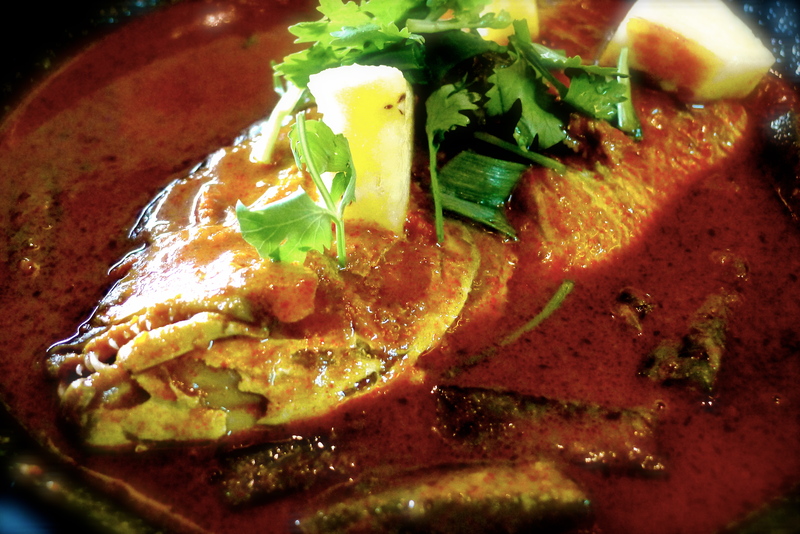 And of course in the 90-some degree weather + humidity, I couldn’t and didn’t say no to fish head curry. I’d heard about Muthu’s Curry and weather was not going to deter me from getting hotter and sweatier. I stopped by for a late lunch with a fellow, curry-loving chef. At first glance, I didn’t expect to like Muthu’s. It’s not directly in Little India, the venue is huge and was pretty empty when we arrived, and like every other Indian place, there was a huge buffet area, which was also rather bare. The staff was gracious and inviting and the BOH staff looked clean-cut so we gladly sat down. We started with fresh lime juice (freshly squeezed and not too sweet), samosas (eh, skip ’em) and continued with spicy fish head curry for two and garlic naan. I’ve never been to Southern India, let alone India, but I know delicious when I taste it. 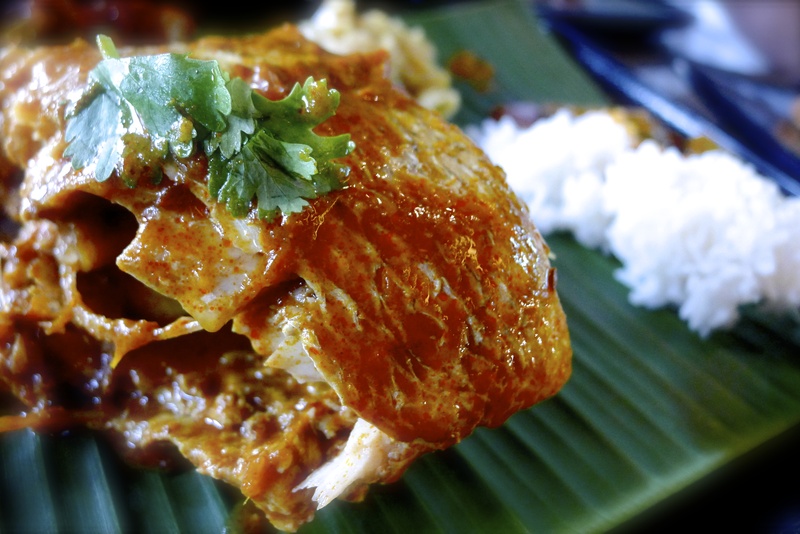 The fish head was fresh, tender, juicy and aromatic throughout; the creamy, luscious curry broth had penetrated it entirely. The curry packed just enough spice and heat–not so much to make my shins sweat, but enough to have me going for an occasional bite of pineapple and enough for me to balance my quantities of naan and lime juice so I was able to finish all three–juice, naan and curry–at the same time, leaving my plate spotless. Even the okra was good. That’s a tell of a good curry: 86 okra. This entry was tagged curry, fish head curry, naan, Singapore. Bookmark the permalink.